The seasonal flu vaccine protects against a number of strains of flu virus recommended by the World Health Organisation (WHO) as the strains most likely to be circulating during flu season. The viruses change each year. This is why it is important to get a new vaccine each year. 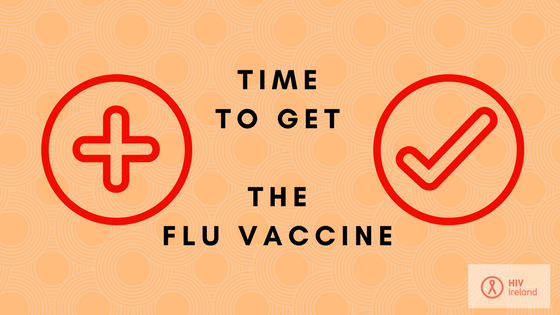 The vaccination is usually available from September/October each flu season. The flu vaccine is free if you are in an ‘at-risk group’ but you may be charged a consultation fee, unless you have a Medical Card or a GP Visit Card. people aged 65 and over. those with a long-term medical condition such as diabetes, heart, kidney, liver, lung or neurological disease. people whose immune system is impaired due to disease or treatment. people with a body mass index (BMI) over 40, including all cancer patients. pregnant women (can be given safely at any stage of pregnancy). residents of nursing homes and other long stay institutions. people with regular close contact with poultry, water fowl or pigs. Should I get the flu vaccine if I have HIV? Yes. People living with HIV are considered to be an ‘at-risk group’ and are eligible for a free annual flu vaccination. Unlike a cold, flu can have serious symptoms such as fever, muscle aches, headache and fatigue. For ‘at-risk groups’ it can lead to complications. These can include chest infections such as bronchitis or pneumonia. Will the flu vaccine interact with my HIV medication? No. The flu jab does not interact with any HIV medications and is safe to have whatever HIV treatment you’re taking. The vaccine is safe to have have if you’re living with HIV and will reduce your chance of getting ill with flu during the winter months. Ideally, vaccination should take place in September and October each year. You can get a flu vaccine through your GP or Pharmacist (for everyone 18 years or older). If you are under 18 years of age you should attend your GP for vaccination. If you are concerned that your GP doesn’t know about your HIV status, then please speak to someone at your HIV clinic about where to get vaccinated. Is there a charge for the flu vaccine? The flu vaccine is free in Ireland if you are in an ‘at-risk group’. This includes people living with HIV. You may however be charged a consultation fee if you do not have a Medical Card or GP Visit Card. The vaccine starts to work within two weeks. If you are 65 years of age or over, or have a long term medical condition, you should also ask your doctor about the pneumococcal vaccine which protects against pneumonia if you have not previously received it. You usually only need to get this vaccine once. The Health Service Executive Ireland provides more information on the Flu Vaccine here.